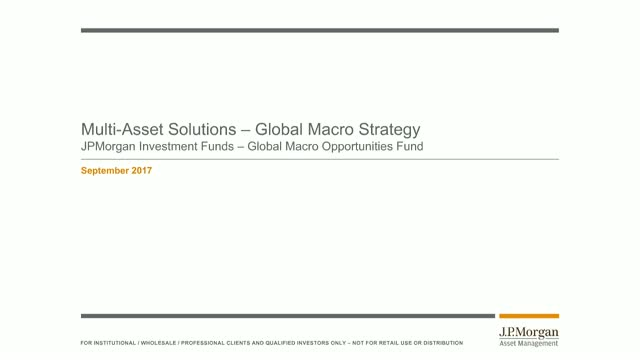 Please join the Global Macro Portfolio Management team for an update on the macro environment, our positioning and performance. The Global Macro Opportunities Fund aims to capitalise on global macroeconomic trends to drive returns using a dynamic, multi-asset approach that aims to deliver positive returns in different market environments. The fund capitalises on the expertise of an experienced team of investors, who reflect their macro views by investing flexibly across asset classes using a selection of traditional and sophisticated investment strategies. When it comes to investing in the world’s largest economy, the £3 billion JPM US Equity Income Fund really stands out from the competition - especially now that it’s reached it’s 10 year anniversary. Join Clare Hart, Lead Portfolio Manager, for an update on recent performance, the outlook for 2019 and how the fund’s exclusive focus on quality, value and dividends allows it to share in the long-term growth of the US stock market while keeping a lid on volatility whenever the going gets tough. Clare will also be joined by Karen Ward, Chief Market Strategist for EMEA, who will provide an update on the US economy and where she thinks the challenges and opportunities will lie in 2019. This will be a very informative 30 minutes as we look to drill down into what is driving the US equity markets. There will also be the opportunity to put your questions to both speakers during the webconference so don’t miss out! Join James Illsley, portfolio manager of the JPM UK Equity Core Fund, for an update on how rigorous control of active risk in his low cost fund has helped deliver consistent outperformance through previous episodes of economic and political volatility. Join Dennis Eldridge, Investment Specialist within the Emerging Markets and Asia Pacific Equities team, as he discusses why we remain constructive towards the long-term growth of Asia. On 20 March 2019, the Board of JPMorgan American Investment Trust plc announced their intention to change the large cap component of the Company by transitioning to a high-conviction investment approach. Subject to shareholder approval, the large cap component will transition from a portfolio of approximately 60 stocks led by Garrett Fish to a concentrated portfolio of 30-40 stocks led by co-managers Jonathan Simon and Timothy Parton. In this call, Simon Crinage, Head of Investment Trusts, J.P. Morgan Asset Management and co-portfolio managers Jonathan Simon and Timothy Parton, will describe the proposed changes taking place and introduce you to their value and growth investment approach. The future of fixed income is anything but fixed—it’s flexible. With the return of market volatility, fixed income investors need to look beyond conventional bond strategies in order to generate returns and mitigate losses. Iain Stealey, International Chief Investment Officer and head of Global Aggregate Strategies within the Global Fixed Income, Currency and Commodities group, discusses where he’s currently finding opportunities in the bond markets and why investors need to employ a flexible approach that spans across all global fixed income sectors. Join Karen Ward, Chief Market Strategist for EMEA, as she uses charts from the Q4 Guide to the Markets to discuss the key themes shaping global markets. Karen will be joined by Mike Bell, Global Market Strategist and Nick Gartside, International Chief Investment Officer of our Global Fixed Income, Currency & Commodities group. For those investors concerned about a market downturn at some point in the coming years, we will consider strategies that may increase the resilience of a portfolio. The discussion will be followed by a Q&A session where you can submit your questions and receive live answers on the issues that matter to you. Participating in the webconference will qualify you for 45 minutes of Structured CPD, accredited by the Chartered Insurance Institute (CII) and the Chartered Institute for Securities and Investments (CISI). The official J.P. Morgan Asset Management webconference channel for UK Advisers, Wealth Managers and Paraplanners lets you stay up-to-date with our fund range, the investment markets and major issues currently confronting investors. To stay up-to-date with our latest webconferences, events, articles and more, follow @JPMAM_UKAdviser on Twitter.